The 77-metre Legend is equipped with a wide range of onboard facilities, including a gym, Balinese spa with sauna and jacuzzi, beauty salon, movie theatre and entertainment system, swimming pool and a broad collection of toys ranging from paddle boards to jet-skis and snow scooters. The 77-metre Legend is equipped with a wide range of onboard facilities, including a gym, Balinese spa with sauna & jacuzzi, beauty salon, movie theatre and entertainment system, swimming pool and a broad collection of toys ranging from paddle boards to jet-skis and snow scooters. 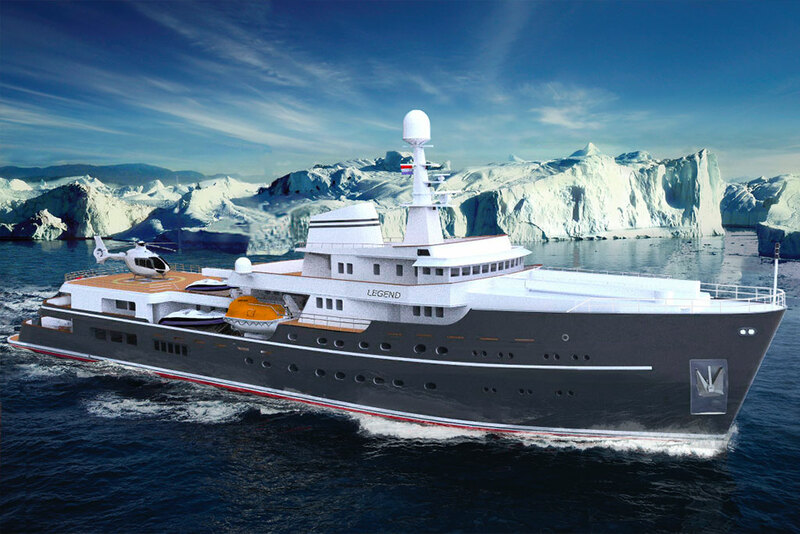 The EYOS team will be working with the yacht to deliver once-in-a-lifetime experiences and tailored, world-class expeditions in a standard of luxury that has previously been unobtainable in these regions. Their experienced staff, backed by decades of expedition expertise, will tailor every charter to the guests’ preferences. They’ll craft a bespoke itinerary and provide the most knowledgeable and personable Expedition Leaders, historians, naturalists, photography experts and Divemasters to bring the destination alive. The contemporary interior design and accommodation — created by Verkerk Yachting and Interior Design in the Netherlands — includes a Master Stateroom with a king sized bed, a settee/sofa, office, a bar and luxury en-suite bathrooms, for him and her, with a spa. There are also seven Double Suites (with queen sized double beds), three Twin Suites and two convertible cabins. For those wanting to maximize their adventure, Legend also offers the rare opportunity to explore both above and below the surface. The yacht is equipped with a helicopter and a three-person submarine capable of diving to 300 meters below the surface. Both the submarine and helicopter are available at extra cost.